Painted Hero is a really good movie. 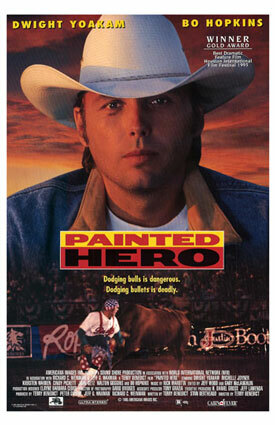 Dwight Yoakam is Virgil Kidder. He's a rodeo clown. A long time ago he left his family, but now he's come back. Then he meets Teresa (Kiersten Warren) who is a little crazy. She thinks she's a vampire. During one night, Teresa dies under suspicious circumstances. Virgil is blamed for her murder, and now he has to clear his name. This is a great movie because the acting is first-rate. Dwight Yoakam puts in a convincing performance. The writing is offbeat and different. I can't believe this movie went DTV. It shouldn't have met that fate. In the end: If you want an unusual drama, Painted Hero is a good choice.